Is it possible to buy property in Costa Rica with Bitcoins? Bitcoins are not new, they exist since 2009. The Bitcoin (BTC) is the first cryptocurrency that has been created and a cryptocurrency is a digital asset designed to work as a medium of exchange. Cryptocurrencies are classified as a subset of digital currencies and are also classified as a subset of alternative currencies and virtual currencies. Until recently, people were not talking much about it but in 2017, the market exploded and people who invested at 100$/BTC have made up to 20,000 time their initial investment and have a lot of money to spend. They can now deposit in their US account and pay the income taxes on the profit they made, and spend the money in the States. What if they want to buy a property in Costa Rica with that money? As of today, they cannot transfer the money here or in an Escrow account because Bitcoins are not accepted as a legal currency in Costa Rica. The banks in Costa Rica and the Escrow companies don't recognize the incomes from the sale of cryptocurrencies as being legal and don't accept the deposit coming from it, even if it comes from a U.S. or Canadian bank account. Cryptocurrency is something seen as dirty money, as being strange because it is unknown. People don’t know what it is, how it works because they cannot buy them or sell them here yet. 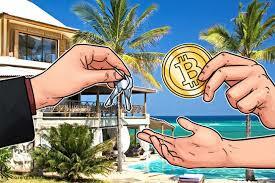 A Bitcoin real estate transaction is possible in Costa Rica only if a buyer transfers Bitcoins to a seller. But the chances to find a seller that would accept 100% of the sale in Bitcoins is, at this moment, rare in Costa Rica. I believe it is just a matter of time before things change. The banks and Escrow companies will eventually have to accept the funds when they will realize how many clients they are loosing. People will find a way to purchase without them. New companies with innovative solutions will replace the typical banks to make their usual transaction and the banks will end up losing their clients and business. Only the older population will stick to them, and they are generally not the ones with money. The Costa Rican government would be the first one to profit of it by charging an income tax, which would help to improve our infrastructures and reduce the level of poverty. There’s already some real estate website showing prices in cryptocurrencies in the States. If we can pay with Dollars, Colones, Euros, we should be able to pay with Bitcoins. I can’t wait to make an update on our website and have a section “Buy with Cryptocurrency”! Want to buy with Bitcoins or sell your property and get paid in Bitcoins? Contact me!